This map replaces each state with the United States corporation that best represents it. Explanations below. 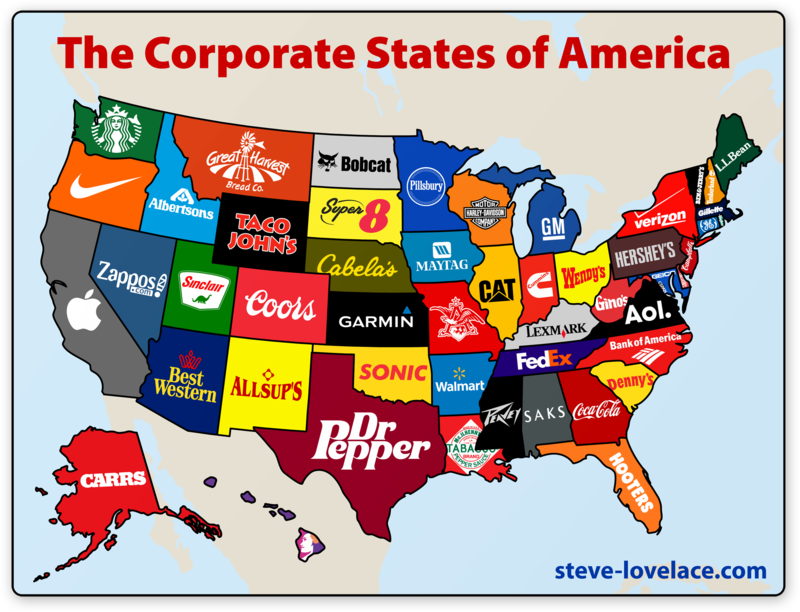 Steve Lovelace created ‘The Corporate States of America’ for his blog & now sells prints due to its popularity. Each corporation was chosen based off several criteria including having ties to the state, popularity in the state, and still being in business there (as of 2013). His picks are right on the money. That said, I’d rather have something besides Dr. Pepper represent Texas. Check out his original post which has the full explanation for each state. WELL, THIS IS IT OF AMERICA! THE POWER OF ECONOMY! THE BEST ECONOMY OF THE WORLD!